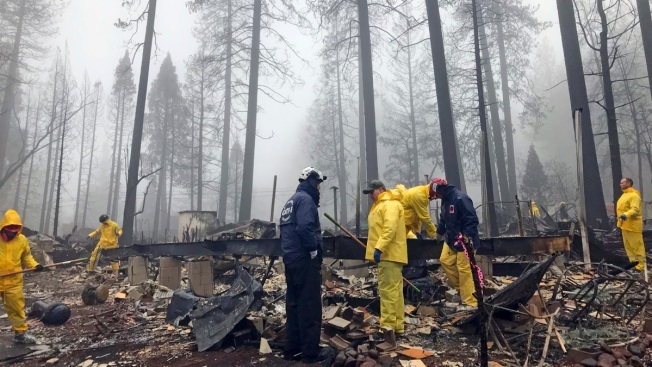 In this Nov. 23, 2018, file photo, volunteers search for human remains at a mobile home park in Paradise, Calif. Task force leader Craig Covey, center left, says his team is doing a second search because there are outstanding reports of missing people whose last known address was at the mobile home park. As the year draws to a close, Associated Press reporters on the front lines of some of the year's heartbreaking stories offer up accounts of compassion and decency. "I really had two choices when it came down to how to respond," Myers said. "One of them was ... curl up with a bottle of scotch. The second choice was to act upon it. I chose to act upon it." "There's no question that he's been super, and it's hard to imagine that anybody could have done a better job," Charny said. "He has the right touch. He has maintained through all this a sense of humor. I don't know how he's done that." Myers has vowed to no longer use the word "hate." "To me, that's the mission that has come out of this, that for 11 beautiful people to have not died in vain," the rabbi said. "The conversation about hate speech in America must be elevated and it must gain attention, because that type of speech leads to action such as what happened at my synagogue." "It was apocalyptic up there," Covey said several weeks after returning home to Costa Mesa, California. Covey's team is deployed by the Federal Emergency Management Agency to disasters across the country and beyond. Earlier this year, his team helped rescue an exhausted 82-year-old man who had been flushed out of his car by floodwaters and pinned in some trees amid Hurricane Florence in North Carolina. "We weren't shaking hands with people," Covey said. "But we were making a difference for folks, for closure, who are missing their families." When classes resumed in late February following the massacre of 17 students and staff at Parkland's Marjorie Stoneman Douglas High School, a therapy dog by the name of Fergie was brought in. "It turned out that was one of the students who lost most of his friends in the shooting," said Fernandez. "Some of our dogs like Fergie are very in tune with human emotions." Fernandez's organization sent 35 therapy dogs and their handlers into the school. All of the animals were trained and selected for their calm, happy demeanor. Some Parkland students specifically asked for a dog to shadow them during classes, saying that the animals' presence eased the stress of returning to a place where such a horrible thing happened. "It's nice not to be asked any questions, to not have to relive the event," Fernandez said. "Everyone grieves differently. Students who didn't want to talk could pet a dog." "There's really not much of a difference between myself and any of the residents who are here at the homeless camp, other than sort of luck of the draw and geographic-political lottery," she said. Tester, who is non-Indian, said she did it because "it's in my neighborhood." "If it wasn't for her, we'd be cold, because she brings us warm blankets," Thunder Hawk said. AP writer Jocelyn Gecker contributed to this story.